How to Live from Your Heart brings a wonderfully warm exploration of energy-based spirituality into real-world decision-making. 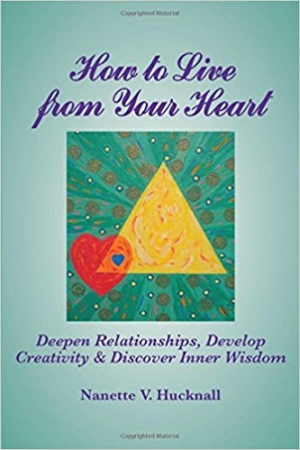 The secrets of developing human intuition drive the helpful and rich How to Live from Your Heart: Deepen Relationships, Develop Creativity & Discover Inner Wisdom by Nanette V. Hucknall. The book seeks to help people connect to their “heart energy” and “higher self” through a series of teachings, parables, and reflection exercises. The book explores topics such as defining the “heart center,” relating to others, applying heart energy, and how to enrich the human experience. The goal of each of these is to help people deepen their connection to the wisdom of their higher selves, and develop the strength to make that connection work. The book theorizes that there is energy in the universe—a higher power—and that having a better connection to that energy helps people heal and become whole. The heart is the symbolic representation of wisdom and connection to the divine. If people are better attuned to that connection, they will be able to have better relationships with themselves and others and, ultimately, the world will be a better place. This argument is strong; it doesn’t limit growth to one religious understanding, and it seeks to offer a broad spiritual transformation. The work outlines the process by which humans connect to their higher selves and determine goals for themselves and their lives. In that light, How to Live from Your Heart is a really excellent guide. Most similar books offer a chapter at most on guided meditation, with maybe a handful of examples. This book offers dozens of guided meditations and reflections for people to try. They are specific, clear, hopeful, and meaningful. These exercises alone make the book worth reading. In style and tone, How to Live reads like a self-help book that honors relationships, connection, self, and discovery. It pauses frequently to explore and explain topics, putting more complicated issues into everyday language. The author is a psychotherapist, and that sensibility is easy to see on the page, but it’s mixed with a more general energy-focused spirituality. The book also offers longer stories in each chapter, attempting to turn the theories into narratives. These generally work, although some are a little too obvious in their agenda. The book offers stories like one about a couple who are not “heart-source” connected. Well into their marriage, problems are uncovered when they take a trip. The solution is a better connection to the heart and what that will mean for their lives. This might be a little heavy-handed, but it also brings the more esoteric spirituality to life.